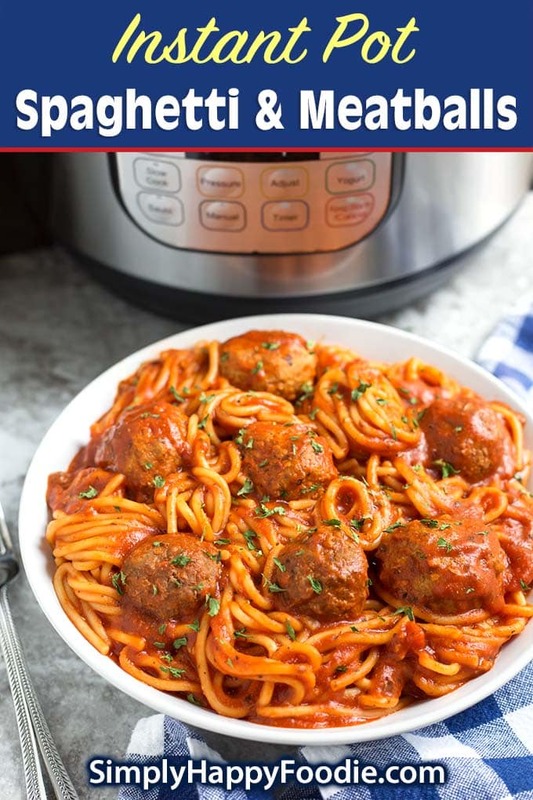 Instant Pot Spaghetti and Meatballs is a one-pot meal that is so easy to make! 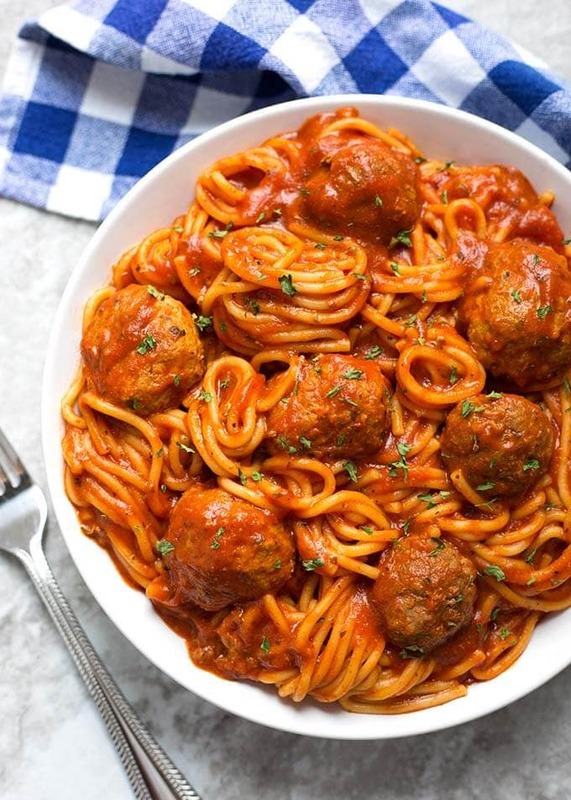 If you have some frozen meatballs and sauce on hand, this pressure cooker spaghetti and meatballs recipe will be ready in under an hour! It is delicious, easy, and no need to boil the pasta separately. Making pasta dishes in the Instant Pot is not something most people would think of doing, but it’s really great! No pot of boiling water or draining to deal with. The noodles get a chance to soak up the flavors of the sauce. Dinner ready in under an hour! 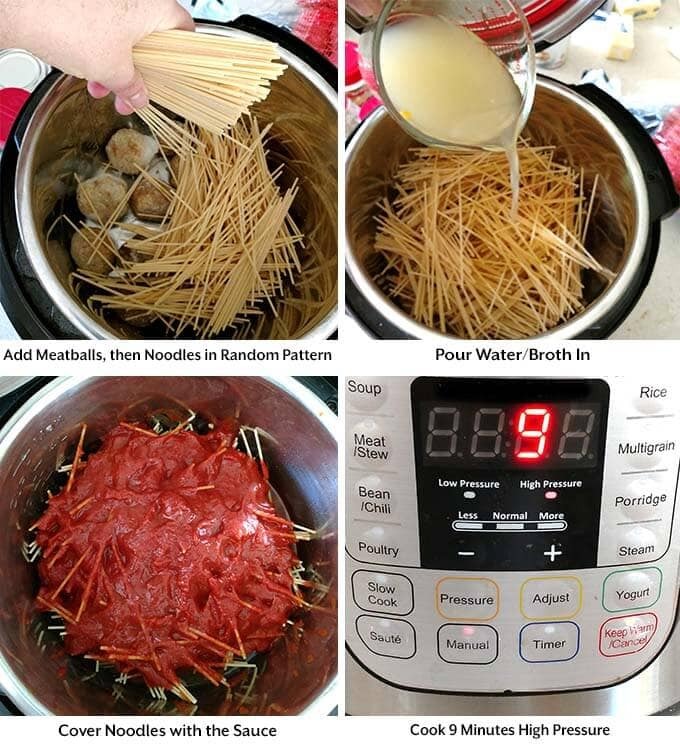 When making Instant Pot Spaghetti and Meatballs, just remember to layer the ingredients in the pot and don’t stir it until after pressure cooking. This helps keep things from sticking, and ensures that the noodles get cooked. If you prefer your spaghetti with meat sauce, check out my recipe here. You cook the meat in the pot and add the rest of the ingredients in layers like this recipe, before pressure cooking. You don’t have to use spaghetti noodles in this recipe. If you prefer penne, macaroni, or even shells, that’s fine. You may need to adjust the pressure cook time for the type of noodles you choose. The rule of thumb for pressure cooking pasta is half of the recommended time on the package. So if the package directions calls for 9 minutes, you will cook for 4 or 5 minutes in the pressure cooker. 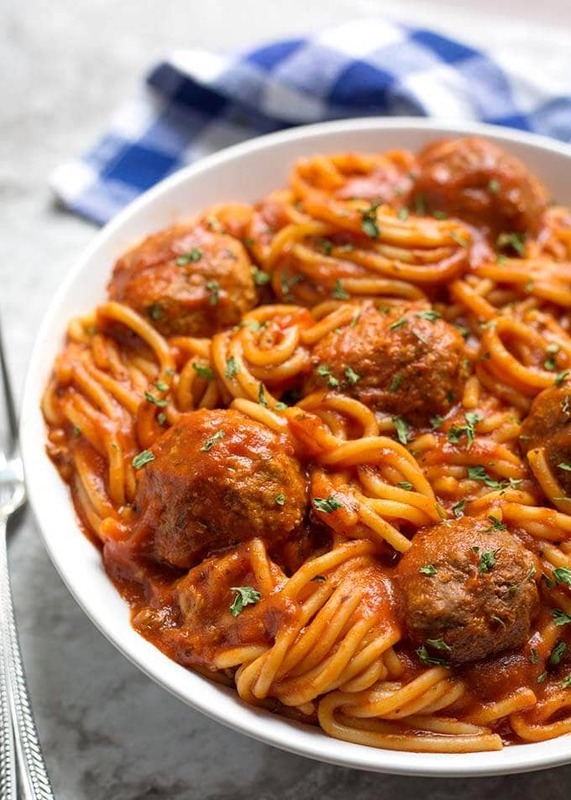 Instant Pot Spaghetti and Meatballs is a delicious one-pot meal. 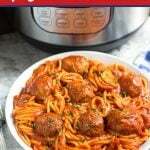 This pressure cooker spaghetti and meatballs is easy to make and is ready in under an hour. Put meatballs in the bottom of the inner liner pot. 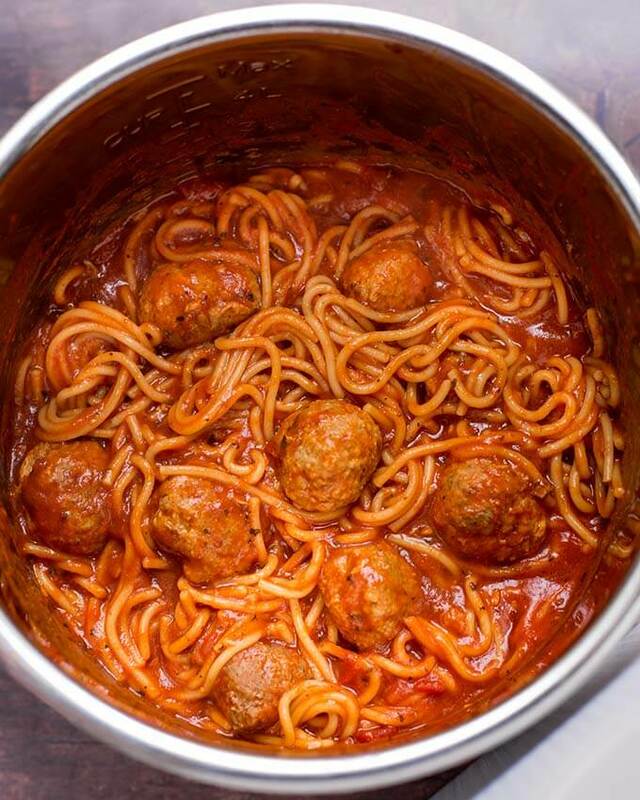 Break the spaghetti in half and sprinkle over meatballs in a random pattern, so not too many are side by side. This helps prevent them sticking together. Pour the diced tomatoes, if using over the noodles, and then the spaghetti sauce over the noodles, and cover as much of them as you can with the sauce. This helps them all get cooked. Put on the lid and set the steam release knob to the Sealing position. Press the Pressure Cook (Manual) button or dial and then the +/- button or dial to select 9 minutes (7 minutes for al dente). The pot will take several minutes to come to pressure. Cook time begins when pot is at pressure. After cook time has finished, turn off the pot and turn the steam release knob to the Venting position, and do a Quick Release of the steam so the pasta doesn't overcook. Watch it closely, and if sauce starts to spew out with the steam, close the vent and release the steam in bursts until it looks like no more sauce will be spewing out. After the pin in the lid drops down, open the lid and give the spaghetti a stir. If any noodles stuck together, just use a fork to separate them. Serve with some bread, and garnish with parmesan cheese, mozzarella, or whatever you like! Hi Sue, Thank you for your review. I’m happy you liked this spaghetti recipe! Do the meatballs have to frozen? No, I think it’s best with frozen, but it will work with thawed, too. Yes! I do it often. Finally got over the fear of my one pot and made this tonight. Turned out great. Was a little alarmed at how soupy it was, but let it sit for a few minutes and stirred, it thickened nicely! I’m glad you faced the fear and won! Yes, the spaghetti looks so soupy at first. So glad you liked it! 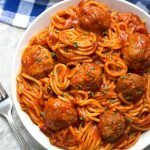 Every recipe I have seen for the instant pot uses jarred spaghetti sauce. I was wondering can I use homemade sauce? I don’t like jarred sauce and have always made my own. Hi Tracy, yes, that’s a shortcut, however I also like to make my own sauce and use 3 cups of sauce and the rest of the recipe as is. Noodles were cooked perfect at 9 min. I did add diced tomatoes and it was a little thin for me I prefer a thicker sauce Next time I won’t add the tomatoes but it tasted great! Good to know, Kathy. Thanks for the feedback. You could drain the tomatoes if you ever want the chunks in there. Just got got my instant pot & this is going my first time using it & this is the recipe my family choose us to try in it wish me the best of luck. But I do have one question can you use the crock pot liner bags in our instant pot, I just love them with the easy clean up & all. Hi Dawn, unfortunately the slow cooker liners are not suitable for pressure cooking. I hope you enjoy the Meatball Pasta Dinner! This was so easy and so good! Thank you! It will be the Instapot for spaghetti for now on! Yay! That’s great! Thank you for your review. This is the first time I used my Instant Pot and this was absolutely delicious!! That’s awesome! Thank you for the review! First try at spaghetti in the IP. It was incredible! Hubby loved it! I made it as printed, but omitted the tomatoes. The consistency was perfect for us. Added some seasoning and onions – then some freshly grated parmesan after cooking. Perfecto! Can you use uncooked meatballs? For the uncooked meatballs, just place them in the bottom just like the frozen . . . and cook the same time (9 min)? If I make homemade meatballs and add them uncooked with the noodles, won’t it be greasy from the hamburger cooking? I just got an instapot yesterday and wanted to try this as my 1st meal. I would like to do 16 oz of spaghetti, do I use the same amount of water and cook time? You will want to double the water and sauce if you double the pasta. Keep cook time the same. I used thawed meatballs. This recipe turned out perfectly. I want to try this tonight. I am making homemade turkey meatballs is the cooking time any different with non frozen meatballs? Thanks for your time. Love your recipes. Thank you, Michele! The cook time is the same as that is what the pasta needs. If the meatballs are UNCOOKED and raw, I suggest placing them on a lined baking sheet and baking them at 375° for 10 minutes to give them a little head start, and firm them up first. Made this tonight, but read the recipe wrong and added 3bottles of water (9 cups). Thankfully, I didn’t add the tomatoes, lol. I dipped out as much as I could, about 4 cups of water,, then turned on the Instant Pot and hoped for the best. Turns spaghetti soup isn’t too bad. Oh no, Jean! I am glad that you partially rescued it! Can you use Jimmy dean sausage instead of hamburger meat as long as I use the same amount? I have an 8qt. Instant Pot and feeding 9 this weekend, how much sauce/water would I need for 2lbs. of noodles and would the time change? Thanks in Advance! Just double the recipe, but keep the time the same. But wouldn’t she quadruple the recipe? She needs 2lbs of noodles and the recipe calls for 8oz/half a pound. Yes, but I wasn’t sure if quadrupling the recipe would fit in her pot. Oh Stacey, I totally get it! My hubby has a list of “won’t eat” foods. I’m happy this recipe was one your hubby liked! I’ve tried this several times and it never disappoints. Thanks for sharing it. That should work fine. Just check the cook time of the pasta and do half that, about 5 to 7 minutes. wonderful all of us really enjoyed the spaghetti. I have only been using the cooker about 2 weeks, egg bites and cooked chicken breast,so this is the first “meal”. I am so glad this turned out great. Sauce was too thin in my opinion, will cut back on the amount of water the next time I make this. Otherwise very easy and tasty! You can also increase the noodles a bit, weighing them is best. Or, drain the diced tomatoes and cut back the liquid a little. Half the recipe for 3 qt mini? Same cook time? Yes, half and same cook time. I’m glad you liked it! It might be watery if the pasta is not measured accurately, I weigh mine, and/or the sauce is thin. Like you said, you can lessen the water, or you could add a little more pasta.